I have just heard the news. The Reubencaster is done! In a recent post, I described a few new projects that I have started. The major project of the bunch was having Reuben Cox at Old Style Guitar Shop modify a cheap Squier Strat to swap out the stock electronics to include two Lollar pickups: the Supro Steel and the Gold Foil in a configuration inspired by the famous Coodercaster. 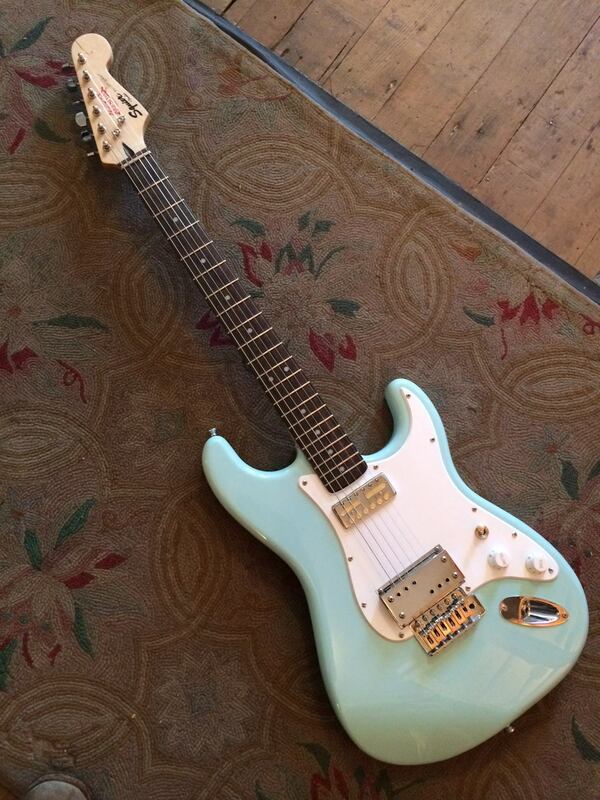 I picked up a Daphne blue Indonesian Squier at a local guitar store and then sent it down to Reuben. I got a message from Reuben earlier this week with a picture of the guitar in progress. Today, he told me that it is now finished. Below is a picture of the finished product. Needless to say, I’m very excited abut this beautiful guitar. The workmanship is fantastic. The modifications are so clean and Reuben assures me that it has sustain “for days.” His correspondences with me indicate that he’s pretty excited about how this project turned out and that, in turn, makes me really happy. It’s nice to know that the kind of guitar I want built is the kind of guitar that builders want to build. It’s not that I had any lack of confidence in my taste, but it’s still nice to be validated. I’ve also gotten a few reports that some rather impressive people who have come by the store today freaked out over it. How cool is that? I’m nervous about its trip up to me, but I can’t wait to play it. Just the thought of it makes me want to work even more on my slide playing. Perhaps I can bide my time by listening to all of my Ry Cooder records. Stay tuned! I don’t remember. You should contact Reuben to see if he’d be willing to take on the project, but I know that he’s gotten quite popular, so it may be hard. Good luck!